Like the most people from my generation, I grew up with Pokemon. I collected the cards, played the game(my first game was Crystal) and, of coarse, watched the cartoon. I liked the cartoon a bunch, but not as much as this comic-series that was based on it. No disrespect to the classic show(my favorite season was the 2, the one with Orange Islands), but this comic is much better. In fact, this is the show on STEROIDS!!! If you love Pokemon(and of coarse you do) then this is a must-have. Electric Tale Of Pikachu is not afraid of being different from the show. Besides being way more funnier, it has some even greater stories. The characters are a lot more interesting, and has a lot more dept. But it's still child-friendly, all considered, and it can be enjoyed no matter how old you are, as long as you have passion for Pokemon. One of my favorite changes is in the tournament, in Ash's final battle. He still lose, but I like the way he lose here allot better. In fact, the whole deal about him being part of a competition is handled much better than in the anime. And I cant understand why Brock and Misty didn't joint the tournament them self in the anime, that would have been a great idea. But the story witch have been under most change is about Sabrina. In the anime, she was a cold, psychopathic telepath. Here... she is, weirdly enough, a very kind shrine-lady. Hell, not onlny is she not the villain, but also the victim, since her Pokemon was killed by a Haunter. Oh, BTW, the manga is a bit darker than the anime, but not so much that kids cant read it. 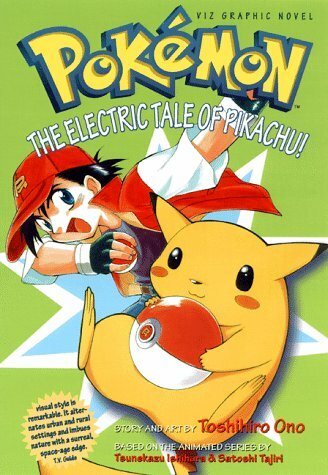 Bottom line is: Electric Tale Of Pikachu is one shocking great read, and highly recommended. One down, 7 to go.